Better Call Saul Review: "Uno"
A mere two years ago, arguably one of the best television series ever ended. While we’ll likely never enter the world of Walter White and Jesse Pinkman again, AMC has given us a look into another of the show’s popular characters with Better Call Saul. Its first episode, “Uno,” toes the line between referencing Breaking Bad and trying to be a brand new original story with mixed results. Fair warning: the majority of this review is going to sound pretty negative, but it’s hard to deny that the cold open was brilliantly shot. It shows Saul after the events of Breaking Bad, working as a Cinnabon manager just as he joked about last time he saw Walter White. His dull life post-lawyer is appropriately filmed with a black and white filter. The only light in Saul’s life, and the only thing in color during the scene, is his own “Better Call Saul” television ad that he has recorded on tape and decides to sit and watch. Sitting in his dark room in his dark life, the only thing that brings him joy is thinking back to a time when he was that Saul Goodman. And then, in an explosion of color, we’re brought to the past where Saul Goodman is not yet Saul Goodman at all. Not only is his name different – we’re all the way back when he was still James McGill – but he is not yet the fast-talking, scummy, and supremely confident lawyer that he later becomes. Odenkirk does a great job portraying this through his slight stuttering, quirky mannerisms, and general lack of confidence and sense of desperation for something to go his way. 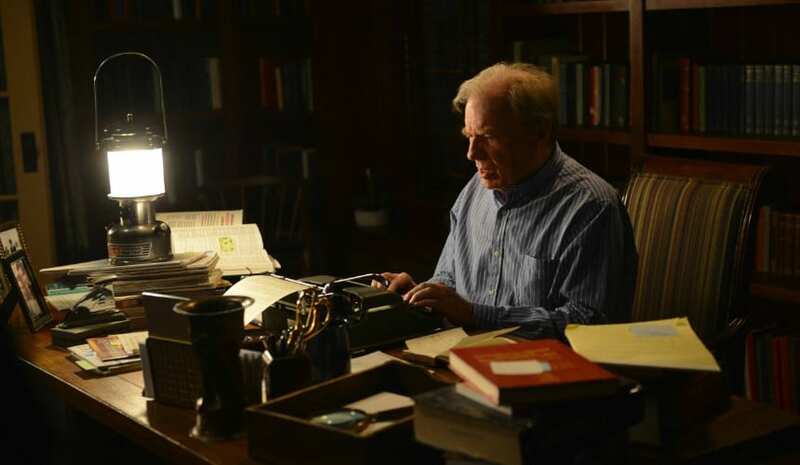 The Saul we knew before had clients clamoring to have him represent them, but Jimmy McGill is chasing down customers and trying to scam them into hiring him. That need to show the audience just how downtrodden and unlucky James is, ends up being one of the real downsides of Better Call Saul’s debut episode. In a way it sort of has to do it, to undo all we know about Saul Goodman later in life, but that doesn’t help the premiere feel any less bland and stilted. The first half of the episode feels extremely disjointed as it shoots between scenarios (although the courtroom scene was great), until it finally settles down into a story in the latter half. Unfortunately it isn’t all that fun or interesting of a story, but it’s cohesive at the very least. There are some interesting plot lines that have nothing to do with Breaking Bad at all, such as McGill’s dealings with the other lawyers and his brother, Chuck. 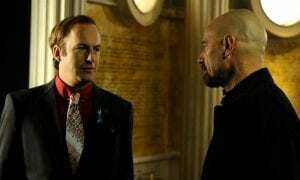 It’s clear that Better Call Saul is going to be a story about rising from nothing into an empire. Just instead of an empire built on meth, James McGill’s empire will be built on shady law practices. Just like the character of Saul Goodman escaping his Breaking Bad shadow, everything else about the show is trying to do the same. It has Vince Gilligan’s fingerprints all over it, but at the same time Better Call Saul is going out of its way to try and not be Breaking Bad. Many scenes that would have worked better with a serious tone, or characters that would be better played straight, get a goofy slant on them so they fit better inside this world than the one that we knew for five years. What it ends up as is a mushy in-between feel where nothing hits quite as hard as it should, but nothing is particularly funny. It also doesn’t help that this first episode crams Breaking Bad references in as much as it can. A lot can be forgiven of a pilot episode such as this, but the confusion between if it wants to split away from its influence or use it as a crutch makes a lot of the episode muddy – especially the blatant character at the end that gets shoved in and will surely play a part in the next few episodes. He comes at a time when it finally starts to feel like “Uno” is getting its own footing and feel to it, then everything turns on its head just so it can squeeze another Breaking Bad reference in. New Mexico is a big place. You can’t tell me James would naturally happen upon all these people who also were in Breaking Bad on pure coincidence. Sure, it’s entirely unfair to compare Better Call Saul to Breaking Bad, but when the show itself is constantly doing the same, it’s hard not to at least bring it up. I have faith that Odenkirk, Gilligan, and the rest of the team behind Better Call Saul can give the show its own life and place in the world given some time, but “Uno” certainly wasn’t the start of it. It’s not a terrible episode but it’s a textbook debut episode, which isn’t necessarily a good thing. The Walking Dead Review: "What Happened And What's Going On"